The debate over the $172.5 million Boise school bond issue is heating up, as Tuesday’s election day approaches. A grass-roots group has surfaced in opposition to the bond issue, Bill Roberts of the Idaho Statesman reported this week. The group, which calls itself Boise Citizens for Responsible Education, is lamenting the bond issue’s sticker price, and points to the district’s own projections that forecast a potential enrollment decline of 1,000 students over the next decade. “We think the school district needs to come back to us with a reasonable plan,” group spokeswoman Rose Pepper told Roberts. The last-minute campaign comes as bond issue supporters continue to line up allies. On Wednesday, supporters announced a new batch of endorsements — from the Treasure Valley United Way, the North End Neighborhood Association, business law firm Stoel Rives, and Boise City Council member Lauren McLean. School bond issue elections tend to be low-key. It’s uncommon to see mobilized opposition to a bond issue. Either way, school elections are stealth elections — supporters and opponents are not required to file campaign finance reports. It’s impossible to know how much money groups are spending to influence the outcome, or the source of the money. Boise’s bond issue is the big ticket item in an uncommonly busy school election day, with $715 million in bond issues and levies on the line. The Boise bond issue includes one new school — an elementary school in Southeast Boise’s Harris Ranch subdivision — but much of the money will go toward replacing and renovating aging schools. The district’s Dennis Professional Technical Education Center would also get an upgrade. The district hopes to check off many projects on its $217 million facilities master plan. 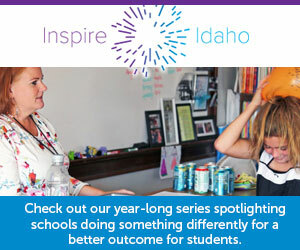 Catch up on “Financing the Future,” an Idaho Education News-Boise State Public Radio series on the Boise bond issue and school elections. Join Idaho Education News and the Boise Metro Chamber of Commerce for a forum, “Donuts and Democracy: a discussion on education policy and funding.” Panelists will be Don Coberly, superintendent of the Boise school District, Karen Echeverria, executive director of the Idaho School Boards Association, Sen. Janie Ward-Engelking, D-Boise, and Clark Corbin, reporter for IdahoEdNews.org. IdahoEdNews.org senior reporter Kevin Richert will moderate. The event is free and open to the public from 9 to 10 a.m. at the Yanke Research Center, 220 ParkCenter Blvd. The event will be broadcast live on EdNews’ Facebook page. And yes, there will be free donuts and coffee. Enrollment grew by more than 5,000 students with 40 percent going to charters; meanwhile, the Boise School District lost hundreds of students. The school has served pregnant teens since 1964. But enrollment has dropped sharply in the past two years, and the district will cut back on the school’s on-site faculty. Turnout for the go-it-alone elections is notoriously and chronically low, falling below 4 percent in 2018.